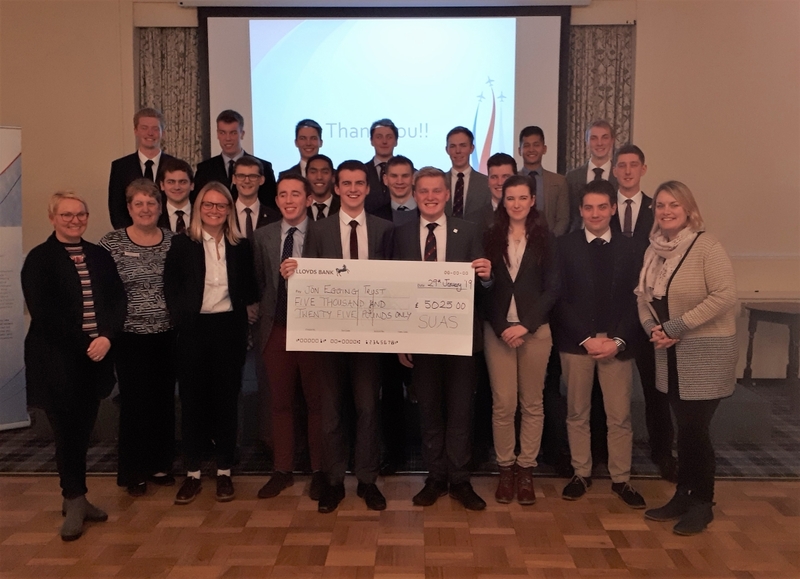 JETLO’s Kaye (Dorset), Michelle (Hampshire) and Regional Fundraising Officer Ruth were invited to attend Southampton University Air Squadron’s (SUAS) January Town Night on 29th January. Talking to a packed room, the JET team updated the current students about the work and development of JET in both Dorset and Hampshire. SUAS chose JET to be their Charity of the Year for 2018 and having participated in the gruelling 100km Isle of Wight Challenge, Dorset Plane Pull (teams of 20 set about pulling a Boeing 737 weighing in at 35,000kg a distance of 50m!!) and helping to fundraise at the 2018 Bournemouth Air Festival, collectively they raised a magnificent £5025. SUAS has a close connection with JET, as Jon Egging and Emma Egging met at SUAS whilst both studying at university. We are extremely grateful for the continued support we have received from them over the years, not only in fundraising but in volunteering at Blue Skies sessions too. It is great to see our JET students engage with SUAS volunteers – being similar in age, there is a close connection between the volunteers and students, which encourages development of communication, teamwork and leadership skills.